Razer has introduced a stripped down version of its legendary BlackWidow mechanical gaming keyboard, simply dubbed the Razer BlackWidow. 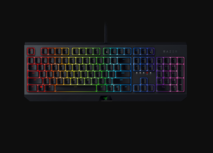 At $119.99 (See it on Razer’s site) it’s the most affordable mechanical keyboard yet from Razer, and aims to offer everything the BlackWidow line is known for at a bargain price. While the BlackWidow Elite comes equipped with a volume wheel and media controls, the BlackWidow doesn’t come with any extras, opting for a more essential design that doesn’t include many of the features found on more expensive keyboards. The BlackWidow doesn’t have any dedicated macro or media controls, and also doesn’t come with the wrist rest found on the Elite version of this keyboard. While the BlackWidow is the “value” option in the BlackWidow keyboard line, it certainly doesn’t act like it. It’s another quality mechanical keyboard from Razer, and though it’s missing some high-end features, for gaming it’s great especially given its affordable price tag.